Water Sales Referendum will appear on the BACK of the ballot in the November 3rd General Election in Kingston, NY. A Water Sales Referendum will appear on the back of the ballot in the November 3rd General Election in Kingston, NY. KingstonCitizens.org encourages Kingston voters to get out and vote ‘yes’ on what would be a positive and historic charter revision on the municipal water protection front for the community, and the region. Kingston, NY – A Water Sales Referendum to include the Kingston Common Council on all sales of water outside of the City’s corporate boundaries will be on the back of the ballot during the General Election on November 3, 2015. Polling places are open on that day from 6:00am – 9:00pm. Over the past year, citizens of Kingston and the region faced a potential threat to its water and watershed during the Niagara Bottling Company’s attempt to purchase a significant share of Kingston’s municipal water supply. During a State Environmental Quality Review (SEQR), it was further revealed that the Kingston Water Board — a four – five member group appointed by the sitting Mayor of Kingston (who is also a member of the group) — was independent of City Government and had the sole discretion to approve such a sale. This decision making body’s power excluded Kingston’s Common Council and, therefore, all citizens of Kingston from the decision making process. 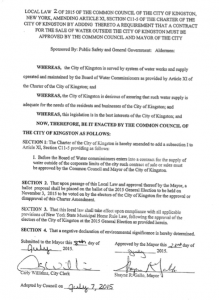 Through KingstonCitizens.org’s unique partnerships, strategic planning and community organizing, Niagara withdrew its proposal after five months of public scrutiny. 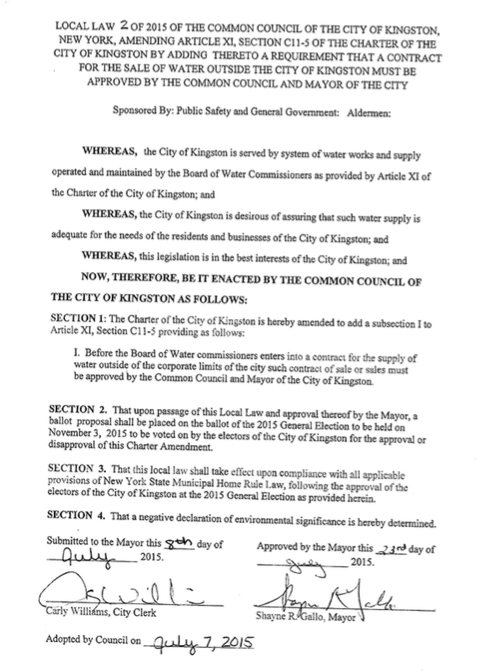 Since that time, KingstonCitizens.org has advocated for a Water Sales Referendum, which would amend Kingston’s City Charter to include Kingston’s Common Council as part of the decision making process for all discussions related to sale of municipal water outside of the City’s corporate limits. As a starting point, amending the City Charter would allow the public opportunities to weigh in on how their water source is used outside of their community. The process to create the Water Sales Referendum was led by Ward 5 Alderman Bill Carey (a Democrat). Carey, who also chairs the Common Council’s Public Safety Committee, where the Referendum was sponsored, agrees. Minority leader and Ward 9 Alderwoman Deb Brown (a Republican) was one of the early elected officials to question the Niagara Bottling Company’s proposal to purchase up to 1.75 million gallons per day of Kingston’s municipal water supply. The Woodstock Land Conservancy (WLC), one of KingstonCitizens.org’s critical partners in educating the public about the Niagara Water Bottling proposal and the sponsor of a recent Watershed Task Force group for the area, also supports the passing of the Referendum. As for what is next for KingstonCitizens.org on the municipal water front, Martin is determined. The Water Sales Referendum will appear on the BACK of this year’s ballot during the General Election on November 3rd. In Their Own Words: Why Does Passing the Water Referendum on November 3rd Matter. KingstonCitizens.org is a community-based organization committed to improving the quality of life of Kingston residents through accountability and transparency between the people and their local government. By providing citizens with current and important information through better communication, our work is meant to nurture citizen participation and empowerment through projects, education and fun.